William and Hannah never came to America but three of their sons did. They were from "Flower," Northamptsonshire, England (now called Flore). 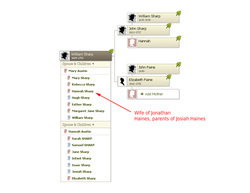 William and Hannah had six children and three of their five sons came to West Jersey, John, Hugh and William. John is our 7th Great Grandparent and two of his sons are our 6th Great Grandparents. Elizabeth Sharp 1656 - ? Henry Sharp 1659 - ? William Sharp - 1670 - ? John Sharp was born in Flower, Northamptonshire, England 29 Dec 1661 (now called Flore). John died about 1727 in Evesham, Burlington Co, NJ. He emigrated to West Jersey with his two brothers, Hugh and William Sharp. It's estimated there were about 40,000 members of the Society of Friends in England and they were being persecuted by the English as dissenters of the Church of England, and by the Puritans. 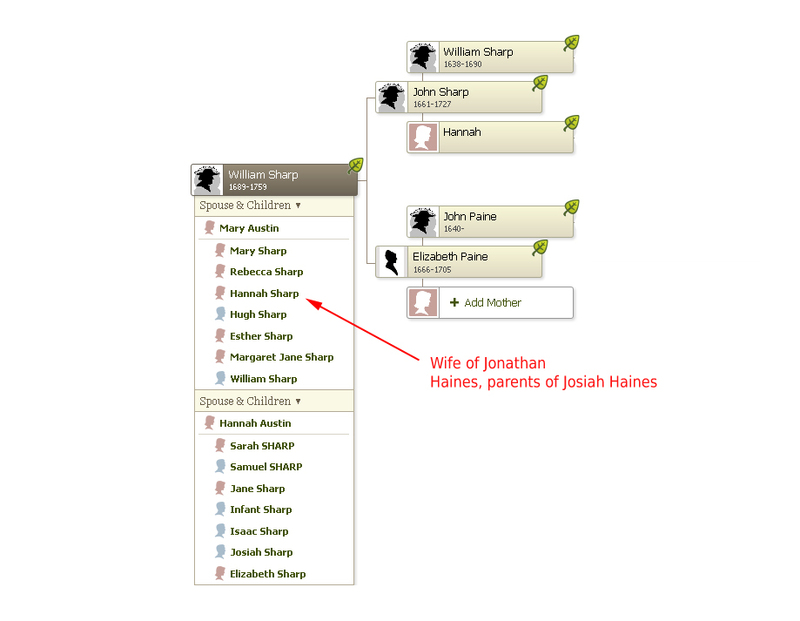 The Sharp brothers were among the migration of these Quakers in the late 1600's. His father and mother never came to the new world. He married three times. He married Elizabeth Paine in Burlington, Burlington County, New Jersey on 17 Jun 1688. He married Elizabeth Paine under the care of the Burlington Quaker Monthly Meeting (MM), Burlington County, New Jersey. Elizabeth was the daughter of John Paine, one of the signers of West Jersey's constitution, "The Concessions and Agreements of West Jersey of America", signed in London in 1676. Elizabeth's parents never emigrated to the new world. 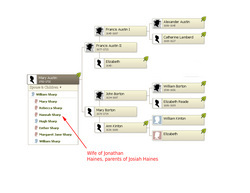 John and Elizabeth had seven children, two of which are our descendants. As a matter of historical and geographical perspective, in 1663, King Charles II of England granted the Carolina territory to his brother, the Duke of York. From this territory, a tract of land called Nova Caesurae or New Jersey was formed. In 1676, a deed divided the land into West Jersey and East Jersey. The above-mentioned constitution was the landholder’s agreement upon a form of government for West Jersey. Elizabeth was born 19 Feb 1665/66. 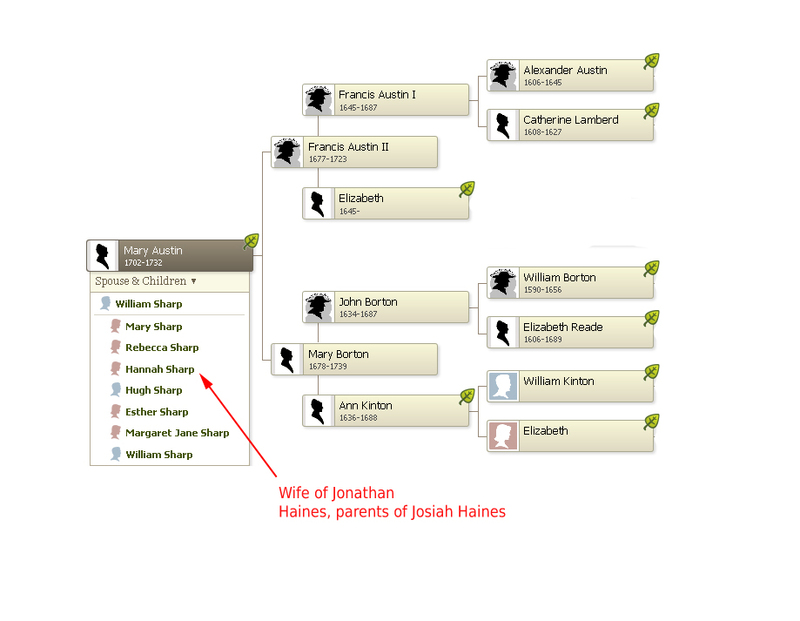 Elizabeth was the daughter of John Paine and unknown mother. Elizabeth died 28 Nov 1705 at 39 years of age. He married Elizabeth Green 11 Apr 1707. She was born about 1662. He married Jane Curtis in Haddonfield MM about Dec 1719. He made a will in Burlington Co, NJ, 17 May 1725. Abstract of Will-1725 May 17: Sharp, John, of Evesham Township, Burlington Co.; will of. First wife Elizabeth Green. Second wife Jane. Children--William, John, Thomas, Samuel, Elizabeth, Hannah Addams, Sara. Real and personal estate. Executors-sons William and John. Witnesses-William Evens, William Troth, Hugh sharp. Proved March 29, 1727 1727 March 28. Inventory of the personal estate, L138.14; made by John Haines and William Evens. From the Sharp Family History, page 11, it states: John settled 1250 acres of land in Evesham Twp., which were located next to Thomas Ballinger. John was frequently mentioned in public business affairs. He arrived in America on the ship "Samuel" which landed at Burlington, New Jersey on the 4th or 5th of September, 1682.
married first Mary Austin and had seven children (Their daughter Hannah married Jonathan Haines 2 and they are the parents of Josiah.) William married second Hannah Austin (his wife's younger sister) and had seven children. Elizabeth Sharp - 1692 - ? Thomas Sharp - 1698 - ? Hannah Sharp - 1700 - ? Sarah Sharp - 1705 - ? Mary Sharp - 1717 - ?